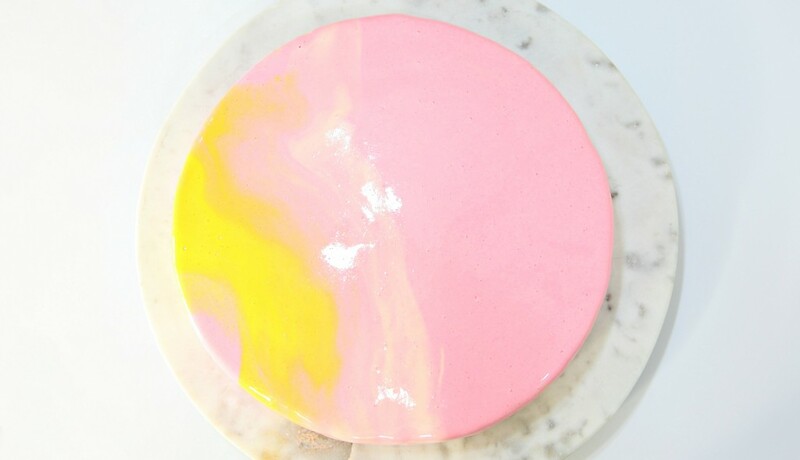 Mirror glaze cakes are taking over the internet, and so I thought I’d give it a go. I absolutely love how this cake turned out. SO pretty, and the glaze wasn’t actually that scary to make! This takes some time, but it’s absolutely one of the best desserts I’ve ever made. I took three days in total, and I’ve got to say, I did lose a bit of sleep during that time, hoping that every part was just right. Nothing like going to pour the glaze over, and discovering the mousse isn’t set! But, it all worked out really well. I’m in love with the mirror finish, and the raspberry puree, just wow! 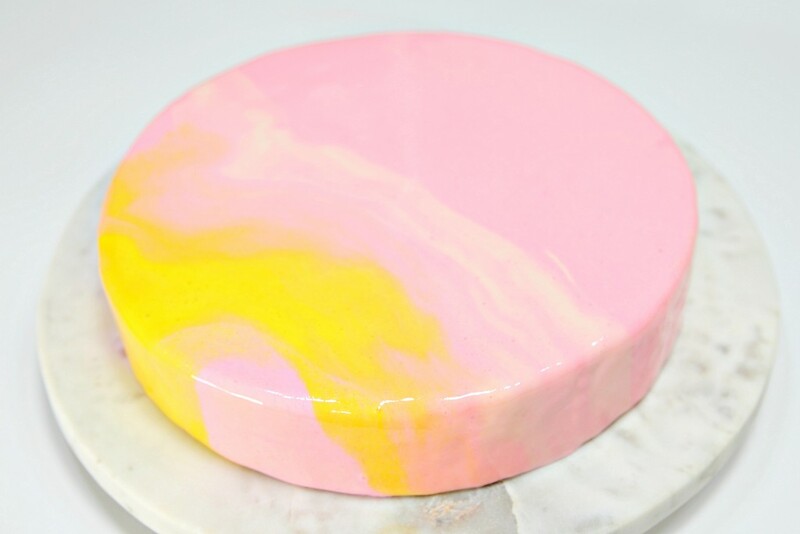 You guys, if you are going to try one dessert trend this year, make it this cake, or should I say Entremet, right here. Add sugar and heat on medium stir until dissolved. Line a 7" cake pan with cling wrap, and once the puree is slightly cooled, pour in pan. Chill in the freezer for one hour. Cover the top with cling wrap to prevent freezer burn. Continue freezing for 12 hours. Using a mixer, beat butter and sugar. Add the rest of the ingredients, and mix for 30 seconds on medium. Bake for 25 minutes, or until a skewer comes out clean. Place 1" of water into a saucepan. Bring to the boil and then turn off the heat. Add the chocolate to a large bowl, and set over the saucepan. Stir until dissolved. Add gelatin and water to a small saucepan and allow to sit for 5 minutes. Then place on medium heat until dissolved. Remove from heat. In a third small saucepan, add 1/2 cup (125mL) of cream and heat on medium until it comes to a boil. Add the gelatin to the cream and stir. Then add this to the large bowl of chocolate, and stir gently until combined. In a cold mixing bowl (I like to chill mine for 10 minutes in the fridge) beat the remainder of the cream until stiff peaks. Careful not to overbeat. Add half of the cream to the white chocolate mixture, and fold together. Add in the rest and continue to gently fold together until just combined. Place the almond cake in the pan, then add half of the mousse mixture. Place the raspberry puree on top, and add the rest of the mousse. Smooth with a spatula and chill for one hour in the fridge. Cover with cling wrap, and continue to chill for at least 12 hours. Place condensed milk, chocolate, and gelatin into a tall heatproof container. In a medium saucepan add sugar, glucose and water. Heat on low until sugar dissolves. Increase heat to medium and bring to 103C/ 217F. Pour over chocolate mixture. Allow to stand for a few minutes. Blender with a hand blender for a few minutes until nice a smooth. I added a touch of whitener to give the glaze more opacity. Try not to get air bubbles. Place cling wrap over the glaze, right over the surface so as not to have it form a skin. Chill in the fridge for 12 hours. Can last 3 days. Remove mousse from springform pan using a spatula to loosen. Remove acetate and smooth the sides. 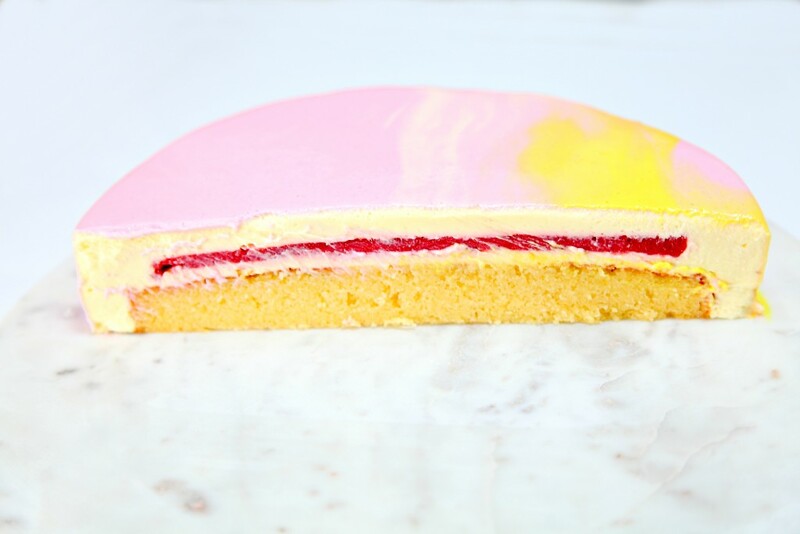 Place on cake board, and rest it on a cake pan, over a large tray. Reheat glaze in a microwave at 50% 20-30 second increments until it reaches 35C/95F. I personally think it would benefit from being a touch warmer. Add food colours and then pour over the mousse cake. Allow it to drip for a few minutes, and then scrape off the excess.